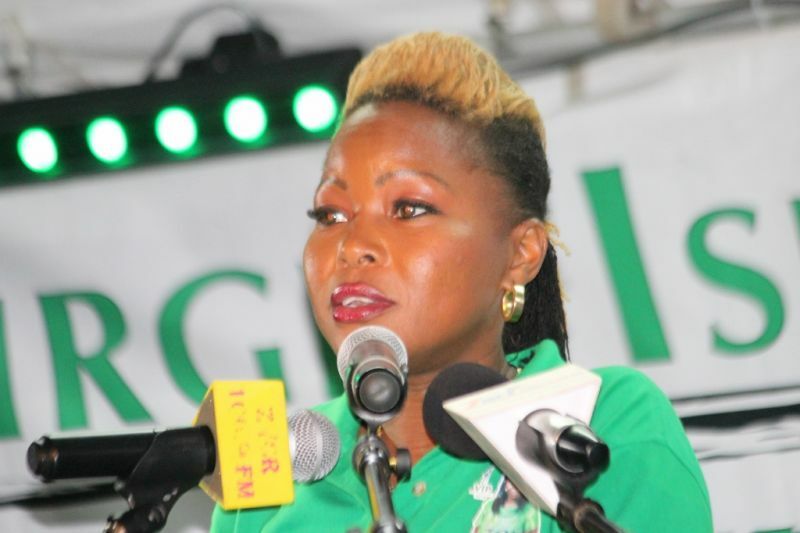 CAPOON’S BAY, Tortola, VI – Virgin Islands Party (VIP) candidate for the Fifth District Zoe J. Walcott-McMillan slapped down and dismissed any inkling that she was interested in joining the National Democratic Party (NDP) though she said she was approached by them. She was at the time speaking on June 3, 2015 in Capoon’s Bay at Honourable Andrew A. Fahie’s (R1) campaign meeting. This was in response to an advertisement allegedly by the NDP which suggested that Walcott-McMillan might be harbouring a consideration about joining them. “A number of them have come to me and I have emphatically shut down any thought process, or any concession that I have an interest in their philosophy,” she said. “I was approached by a gentleman who was encouraging me to their way of life and I said I don’t know if it is the perfume that I am wearing but if that is the case I need to stop. Because it is not like I am shadow boxing with you all. I do not subscribe to your philosophy,” she recounted. According to Walcott-McMillan, the young lady who accompanied the man asked her what she meant by that and seemed upset. Walcott-McMillan said she told her she’ll explain in a way that she could understand. “I said you have Delores Christopher (R5) and you have Alvera Maduro-Caines (R6) and their party treats them as if they are inconsequential because they don’t look like you,” she said. “I said they are not your brand of success,” she said. Walcott-McMillan believes that the current politics is too toxic for the Virgin Islands and stressed that while it is the policy of the VIP to conduct a clean campaign, this does not mean that the party will shy away from defending its image when it is necessary to do so. She noted that everyone from the Virgin Islands Party is always said to be crossing over to the NDP every elections campaign. “Every election Andrew leaving…then I heard ‘All Out’ [Elton L. Sprauve] leaving to do to the NDP, ‘Juggy’ [Elvis J. Harrigan] leaving to go to the NDP. Everybody in this party leaving to go to the NDP,” she said. Over the past weeks, the NDP has been in overdrive with their statements against members of the VIP, especially the Chairman of the party Honourable Julian Fraser RA, who has been the target of their attacks. I like your stance, please keep it that way and do what your heart has told you to do. Zoe we cannot trust you like we did in 2007 and make Julian Fraser Premier of this country,sorry but we are voting NDP all the way. Call back next election. Why is Fraser so hated. He has to be a chosen vessel. Only Jesus Christ was hated more. If God be us, who could be against us. Fraser loves his country. Fraser took the government TT's from the investment club. If you analyze this, you are a strong woman,you will well represent the territory, with either party. Put all the crap aside, the young people will get more leverage in the territory in becoming their own individual, they will better able to governor themselves. You have wonderful ideas, I still waiting to see that Drag Race idea come alive. But, your time will come when either two things happen, put aside all personal feeling of what you think the party is about and get on the band wagon, so we can get some project going. Or you can wait until the people believe in the other party and vote them in, it might be a long time, or a short time. But I know wherever you are you will make remarkable stride. No! The government is NOT working. Why were they FORCED to call snap elections? Much more in mortar than pestle. Ohh you though they were going to stay there taking lick from Fahie and Fraser spreading poison like they did in 2007 and not take them on, correct? Andrew Fahie launched political ads for 3 weeks into 2015 and they did it night after night and day after day so DR Smith said you want it lets go for it. Now they got what they want they crying? Zoe you are my friend, I know you well, I like you. 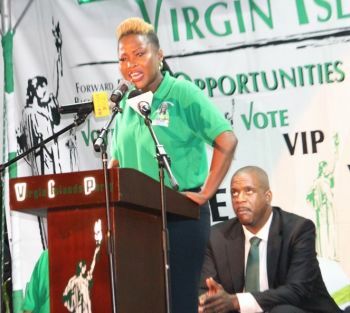 You should have refused to run under Frazer leadership, you are a strong and opinionated lady--Frazer is loved for his good work as an opposition member-- but hated as a leader..that is where you and VIP chances evaporate in thin air. Why you all talking so bad about Fraser. he is a good person and everybody can't join NDP so you all need to give her you all support and stop calling down Fraser. He might shock a lot of you all. ...BUT YOU PREFER TO VOTE A NDP TEAM THAT IS DECEITFUL AND WHO ARE PROUD OF THEIR RICH WHITE FRIEND. WHO ARE SELLING OUT OUR COUNTRY AND DR, SM*** WHO PRETENDS LIKE HE HAS HIS HEAD IN THE SAND. HE IS THE WORST ONE BECAUSE HE KNOWS BETTER BUT THE MONEY TOOOOOOO SWEET! Dr. Smith done know those piranhas he there between. I hope---I wish, and I would like to see these 4 candidates win at-large--Dr. smith, Dr. Dawson. Mr. Walwyn and Ms. De Castro--- this is a good balance of youth, brilliance, good heart, and experience---good for the country- at-large is what interest me......Who ever wins, I want it to be a 5 to 8...or 8 to 5---Keep the balance--no monopoly. Speak truth to power Zoe. Don't mind the naysayers. If the people put in the NDP to control the HOA the people of the VI will regret it for the rest of their lives especially the young people the doctor is not a leader PICKERING is a done deal the lawyer is a //// VANTREPOOL is another //// you all want get rid of the VIP then who leave to watch those sharks people be very careful chose wisely this snap election should be enough to wake up who were asleep.